Today I heard some terrible news. News that makes me want to rage against The Powers That Be and unfairness in the world. But, this terrible news is about the nicest and friendliest dinosaur the world has ever known. And as much as raging against the powers that be seems to be what should be done – it doesn’t seem a Rarasaur thing to do. So I instead, I looked inside myself and found a tiny, inner-dino of my own. Then I looked up and out at the world and found a little #rawrLove to share. The world is full of terrible news – it’s true. 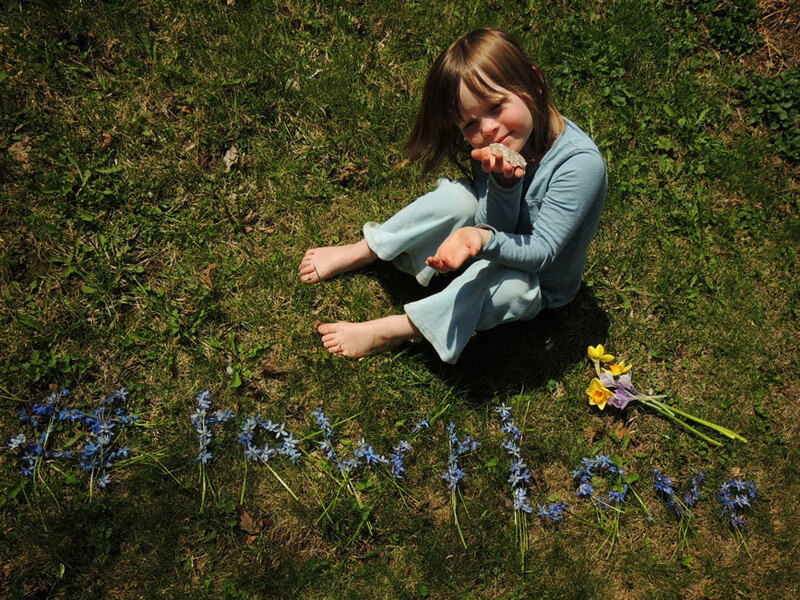 But this part of the world is also filled with spring flowers, and little girls who love them. That’s an old seashell in her hand, Clara thought everyone would love it. She’s a #rawrLove natural. How about you do you have some #rawrLove to share? It doesn’t have to be a photo. Kind words, lovely quotes anything which shows your appreciation for the beauty in the world. Leave it in a comment, mail it to a friend, post it on your own blog, tweet it out. Share the #rawrLove because you love Rarasaur. Share the #rawrLove because we all, even me, have a little optimistic dino hiding inside. This entry was posted in Uncategorized and tagged #rawrLove, flowers. Such a cute little #rawrLove. Thank you. It seemed like the day needed a touch of cute. it did, it sure did. I am inspired by the little people in my house to stop my busy life and whisper to the little creatures in the world, like blue birds, to come live here because we have a great place for you to live. Thank you! I saw your call to arms, they are very lucky to have you as a friend. I think you’ve got that backwards. I’m very lucky to have them as friends. Both ways. I’m sure it goes both ways. The rain keeps coming; the ground is cold and muddy, the air still cold. Does he wonder what I could possibly be doing, day after day, here in this wet, weedy ditch, with my shovel? Beautiful, Helen. You need to start a blog! I love this and put my own flower on twitter for Rara too. Reading her post made me feel like I’d been punched in the stomach. I love your response. Thanks, and thanks for joining in! Her story makes me feel so sad. I will keep her in prayers. Thanks for the heads-up, Jessie. It’s a terrible story, I hope it gets to it’s happy ending… eventually. She’s a very generous girl… as far as gentle energy goes…. well, lets just say we call her “Clara Danger” 🙂 Thanks for visiting! Oh Look! There you are- back!